Constructed between 1890 and 1894, Forest House on Forest Road, St. John's, was built for and occupied by the noted family of craftspeople the Colliers. The house is a two-storey, Second Empire style dwelling known for the quality of its detailing. Eaves and corner boards have decorative dentils, brackets and wooden applique. The entryway is in a mixed Classical/Victorian style with decorative surrounding mouldings and stained-glass panels depicting the actress, Royal mistress and Victorian personality Lillie Langtry flanked by baskets of flowers. French doors that open from the living and dining rooms are surrounded by exterior mouldings and contain stained glass panels. The south extension is a more recent addition. Although Forest House is slightly smaller than the typical Second Empire house, its grandeur is reflected through its ornate wooden detailing and decorative stained-glass. Interior features include 11 foot decorative plaster ceilings, a carved oak staircase, heavy panel doors with deep mouldings, fireplaces with original ceramic tile and decorative mantle pilaster woodwork that matches the exterior entryway detail. There has been some considerable speculation that the plaster work in the living room ceilings was done by Pindikowski, the same artist responsible for the fresco work in the Colonial Building. However, this piece of local folklore has never been confirmed, and appears unlikely given the probable date of construction of Forest House. Other interesting features include a call pipe that runs from the upstairs hall to the kitchen so that servants could be summoned, ceramic call bells in the dining and living rooms, and a "niche" in the front hall, the purpose of which remains a topic of much speculation! The call tube originally had a whistle on the kitchen end, but sadly it has been lost. Much of the 19th century construction and detail remains untouched, and its exterior view remains unchanged since 1907. Forest House is a fine example of a Second Empire style dwelling in the Maritime tradition made popular in Newfoundland by Southcott. Though it is 2-storey rather than the usual 3-storey and the interior dimensions are rather small, the very high quality of the ornamental detail and unique stained-glass work both inside and out gives the house a grandeur beyond its physical dimensions. In its scale, the house fits well with the neighbouring houses but it is a very superior example of its kind. The first recorded occupant was the wheelwright and carriage factory manager, Nicholas Collier (son of the sailmaker Charles Frederick Collier) who remained in the property until 1915. The last Collier to occupy the house was E.H. Collier. The property, part of the original 20 acre New Forest Plantation, likely came into the family through the marriage of Charles to Sara J. Carnell. It is of note that ownership of the New Forest Plantation property on which the house is situated has been documented back to 1792 and though reduced in area, remained in the same family (Carnell/Harris/Collier) until 1966. The Collier name lives on in the area in the adjacent Collier's Lane. In 1966 David Butler, a civil servant, bought the house from the estate of E.H. Collier. In 1972, George and Mary Courage bought the house. Forest House was designated a Registered Heritage Structure on March 27th, 2003 by the Heritage Foundation of Newfoundland and Labrador. 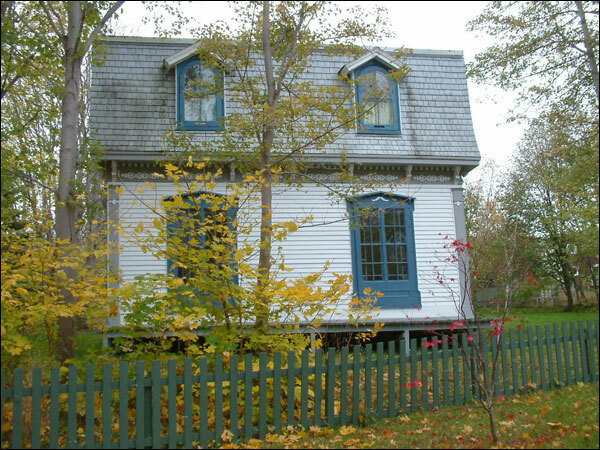 Also view the Forest House Registered Heritage Structure, and the Forest House - City of St. John's Heritage Site on the Heritage Foundation of Newfoundland and Labrador web site. The Newfoundland and Labrador Heritage Web Site has on its site only a portion of the registered heritage structures in Newfoundland and Labrador. To view a complete list or search for a particular structure visit the Heritage Foundation's Property Search page.